A Smart Elbow deflection elbow connects the vertical and horizontal pipe in the vacuum convey line, which transports oats from the outdoor storage tank to process blending vessels located inside National Oats' plant. A cross section of the Smart Elbow deflection elbow: Note the deflection zone depicted at the bottom left. 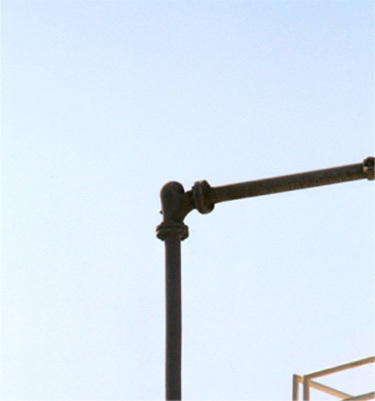 This gentle deflection of material eliminates the impact of material on elbow and pipe walls and of material on itself. This unique deflection changes direction without elbow wear or damage to conveyed materials. Smart Elbow deflection elbow, manufactured only by HammerTek Corporation, are in use at the national Oats plant and other pneumatic conveying systems throughout the world. "Cost-effective, compact, convenient and durable." That's how National Oats' Bob Williams, chief project engineer, describes the HammerTek Smart Elbow® Deflection Elbow. The installation of three Smart Elbow models proved to be an effective flow control remedy, reducing turbulence and abrasion to the elbow walls in his company's pneumatic conveying system. Prior to the installation of the Smart Elbow units in 1985, National Oats, Cedar Rapids, Iowa, a subsidiary of Curtice Burns, Inc., had been using wear-back ceramic sweep elbows (elbows that have a ceramic-coated plate bolted on the back) on its conveying line. A maker of oat cereal and oat flour, National Oats pneumatically conveyed oats from outdoor storage tanks to blending vessels located inside the plant at a rate of 90,000 lbs/hr. through an 8in. pipe line. The performance of these wear-back ceramic sweep elbows created a problem...a problem looking for an answer. The ceramic sweep elbows had to be replaced periodically, which meant stopping the line so that patches of plate steel could be welded over the worn areas of the sweeps. Every two years the entire elbow, as well the entrance and exit transmission pieces, had to be replaced. This resulted in an average of five maintenance calls per year, just for elbow repair and replacement. In 1985 that all changed when National Oats' management was introduced to the HammerTek Smart Elbow deflection elbow, a breakthrough in the technology of elbow design and flow control. National Oats agreed to install three cast iron Smart Elbow models on a money-back guarantee. Since then, the high cost of elbow maintenance and replacement has been eliminated, and the company has installed additional Smart Elbow units on its lines. The revolutionary Smart Elbow deflection elbow is designed so precisely that a slowly rotating ball of conveyed material is formed within a nearly spherical pocket. This ball of rotating material, which is suspended in air, creates its own impact zone and the material flowing through the elbow is deflected around the bend. Little material strikes the elbow walls, reducing wear. 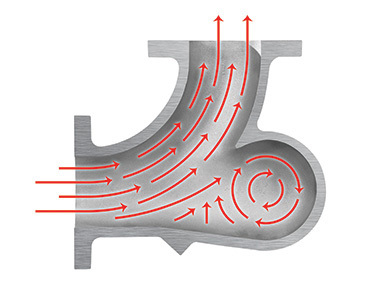 And because the Smart Elbow design conveys material through the entire cross section of the elbow, not just along the outer edges as do sweep elbows, the Smart Elbow deflection elbow establishes vastly improved flow control at no increase in pressure drop, and eliminates plugging and surging. A smoothing of the material flow, eliminating areas of wear created by impact, friction and turbulence. Energy savings. National Oats' estimates that it saves $800 to $1,200 per year in electricity costs for the 75hp vacuum pump used in the conveying system. Product Quality. National Oats' engineers believe they are seeing less oat breakage and a more uniform particle size because of the improved material flow and reduced elbow wall impact. Increased conveying rate. When National Oats replaced three ceramic sweep elbows with Smart Elbow models, the conveying rate increased 11%, from 90,000 to 100,000 lbs/hr. In addition, more even discharge has been observed as the oat storage tanks approach empty. These benefits are attributed to improved laminar flow through the new elbows. No matter what material you are conveying through your Pneumatic Conveying System, HammerTek can prove to you that the Smart Elbow deflection elbow will do everything indicated in this case history. And more! And because of its compact design, it offers installation flexibility without the necessity for compromising system performance. This case history was previously published in the September 1988 issue of Powder and Bulk Engineering. Before you spend any more money on repairs and/or replacing worn-out sweeps or plug tees, talk to us about our Smart Elbow products. We have a special 60-day introductory plan* for all customers. * In stock products only. Contact us for more details.